Khan Lai, a resident in Poipet commune, a boom town on the Cambodia-Thailand border, celebrated a housewarming party in early January. There were some 200 guests including his neighbors and former members of the local, now-dissolved opposition party. But the party was cut short when police spotted the festivities and intervened. Lai, 44, an opposition activist, and other opposition officials were questioned by the police. “Police came to my house and asked me about the party and posts on Facebook,” he said, adding that some opposition Cambodia National Rescue Party (CNRP) officials took pictures and videos showing their support for exiled CNRP leader Sam Rainsy, the party’s former president. More than 100 local opposition officials lost their posts after the CNRP was dissolved in November 2017. “They questioned who are the organizers of the videos and gatherings,” he said, adding that police questioned him at the police station. “I told them that I didn’t know about filming videos since I was busy inside the house,” said Lai, who joined the CNRP in 2012. Lai said that in the afternoon of the day following the party, the provincial police chief, Ath Khem, lead some 10 police in a raid on his house. The video of the raid went viral on Cambodian social media. In December last year, at a conference conducted in the United States, Rainsy who previously resigned from the party, was supported by attendees to be the acting president of the party while Kem Sokha, its president, remains under house arrest. Fear has gripped local opposition officials since the CNRP was dissolved by the Supreme Court in November 2017. For former members of the CNRP, even organizing a private party comes with surveillance and questions from the authorities. The ruling Cambodian People’s Party, led by Prime Minister Hun Sen, bristles with paranoia over the alleged threat of a “color revolution”, even as it has stifled almost all dissenting voices and claimed every seat in parliament in last year’s general election. The CNRP was the country’s largest political party and the only party to win seats in parliament in the 2013 election. Its president, Sokha, was jailed on treason charges shortly before the party was disbanded. He was later placed under house arrest and is still awaiting trial. The CPP claims that Sokha conspired with the United States to overthrow Hun Sen.
At least five people were called by police for questioning, but no one has been detained or charged, according to Lai. But fear has stifled their political discussions and plans for further gatherings. “I am always hiding. I know I am the main target as well,” said Chham Sophan, 41, who was a former opposition councilor in Poipet and also attended the housewarming party. “I can’t stay home like before,” he added. Former opposition officials like Sophan are now wary of using the telephone to communicate, fearing surveillance. “I don’t dare to stay home and now we are even afraid of picking up phone calls,” he said. Mean Sarith, the owner of the house where the party was held and a former opposition party official in that city, said there is “no freedom anymore”. “We can only whisper now,” he said. “If they see many people, they will come,” he said. 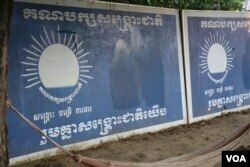 In Poipet, the opposition CNRP won a majority of more than 9,000 at the last election where they were allowed to stand. But immediately following the party’s dissolution, the CPP oversaw a purge of CNRP officials, with more than 5,000 local CNRP representatives losing their positions. The opposition had controlled about 30 percent of local authorities and increased its minority share to 43 percent in local elections in summer 2017. In other districts, two officials who joined the party were issued with a summons to appear at local police stations. Tuon Veasna, a former opposition district chief who received a summons, said he was questioned for about three hours. Police forced him to sign a contract, he said. “They asked me not to hold any gatherings and support for Sam Rainsy and they do not allow us to talk about the CNRP,” he said. “It was a pressure on me to sign the contract,” he said. “I thought they will ask me about the housewarming party gathering, but they asked me about a [social media] post on December 17, in which we showed our support to Sam Rainsy,” he said. “Police now drive around my house day and night,” he added. Ath Khem, Banteay Meanchey provincial police chief, could not be reached for comment. Local opposition now largely keep silent when it comes to political activities. Public support for the CNRP has become risky and, in some cases, illegal, despite the constitution guaranteeing the right to free assembly and association. Even those with no affiliation with the CNRP say they are wary of openly discussing political ideas under the new regime. In Kampong Chhnang province, Chou Sam On, the former Kampong Leang district chief, said early this month that local officials wanted to have a meeting together, but they were told: “police threatened and started noting names.” The planned meeting was canceled. 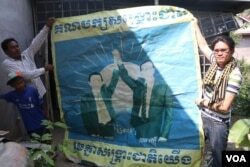 “We want to gather and express ideas about supporting Sam Rainsy to lead the party, but we can’t do it,” he said. In Battambang province, several former opposition officials were questioned over a meeting held to support Rainsy. Seng Rathmony, 46, a former commune chief of Chrey in Morng Russei district, was questioned on December 16 when she gathered at her home with over 20 activists to eat noodles and drink soft drinks. “We haven’t met for a long time and we missed each other,” said Mony during a recent interview at her home. “We don’t have anything to hide,” she said. “They have their own network nearby. If four or five motorbikes enter my house, police officials will call and ask me about it,” she added. In response, Lay Chham, Chrey, the commune police chief, said local authorities have to know about any gatherings taking place in the commune. “Let me ask you whether it is right or not to do that,” he told VOA Khmer in a telephone interview. “What happens in this commune, I have to know as the local authority,” he added. “I don’t allege that they are in the wrong, but the court dissolved [the opposition] already; how come they can be the opposition party now. It is for the courts to decide,” he said. For Lai in Poipet, concerns remain that the police will return or call him in for further questioning. But he said he still wants to be involved with the opposition party. “I don’t aim for any position. I don’t know how to write. But I joined the opposition because I love the party and their officials,” he said.